Brian Terrill's Small-Screen 66 - #52: "MythBusters"
This admonition, in addition to being whole-cloth hogwash (if no one ever “tried this at home,” how could anyone BECOME an expert in the first place?) opens each episode of today’s selection. Fortunately, the hosts dispense with any illusion of formality almost immediately. Jamie Hyneman and Adam Savage, the titular “MythBusters,” employ the scientific method to evaluate the veracity of folk adages, urban legends, and movie scenarios…and they have a blast doing it. The simple brilliance of the premise alone earns this show a spot on the list. The series concept originated in Australia, where producer Peter Rees first pitched it as “Tall Tales or True.” As Discovery already had an “urban legends” program in the works, however, they rejected the proposal. Rees then had the inspiration to, as the intro says, “not just tell the myths, [but] put them to the test.” The program’s focus would be on the testing stage, scientifically evaluating key aspects of each myth. Jamie Hyneman was brought in to host due to his special effects and engineering experience, and Jamie in turn recruited Adam Savage (reportedly, Jamie considered himself too boring to carry the show on his own). For the bulk of the series (excluding Season 1 and the most recent episodes), Jamie and Adam are assisted by a “Build Team” composed of secondary MythBusters who typically test other myths simultaneously. Episodes switch back and forth between the Adam / Jamie duo and the Build Team over the course of the hour as the two groups tackle their respective myths. Build team regulars Grant Imahara, Kari Byron, and Tory Belecci. Unlike previous selection Adventure Time, each episode of MythBusters follows a general formula. The MythBusters begin by introducing the myths they’ll be testing, generally in a conversational style while standing around the workshop set. They identify essential elements of each myth which must be verified, and then start spitballing ideas about how to test them. Once an experiment is designed, the MythBusters will generally construct a small-scale model to test the design’s effectiveness. Then, it’s on to the life-size version. 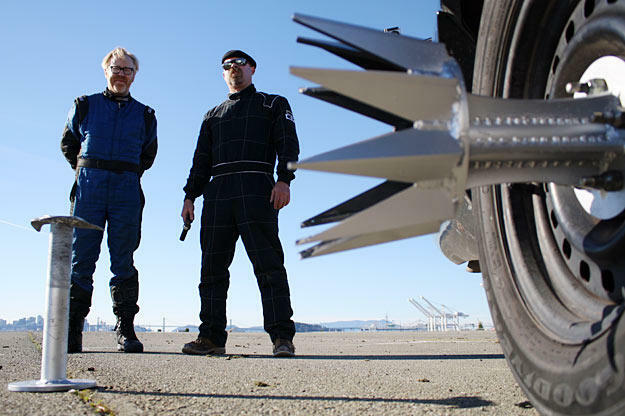 If the full-scale test fails to provide the results described in the myth, the MythBusters will spend the rest of the show’s runtime tweaking the experiment in hopes of recreating the myth proper, even if it means calling in a bit more…firepower. At the end of the episode, the MythBusters declare each myth “Busted,” “Plausible,” or “Confirmed.” A “Busted” myth could never occur under the described parameters, a “Plausible” one occurs under slightly expanded parameters, and a “Confirmed” myth unfolds more or less exactly as described. To me at least, the “Confirmed” myths are always the most fun. One common type of myth is those which make extreme claims about the durability or other properties of household materials. As it turns out, concrete boats and lead balloons are both possible, provided the material is sufficiently thin and adequately dispersed. Paper armor works pretty well, too…at least against swords and arrows. Myths surrounding duct tape have filled at least two full episodes: you can build an all-duct-tape suspension bridge, but not a car-proof barrier. Other episodes explore the question of what exactly is bulletproof (answer: not much). But probably my favorite “materials” myth examined whether playing cards could really be used as deadly weapons. 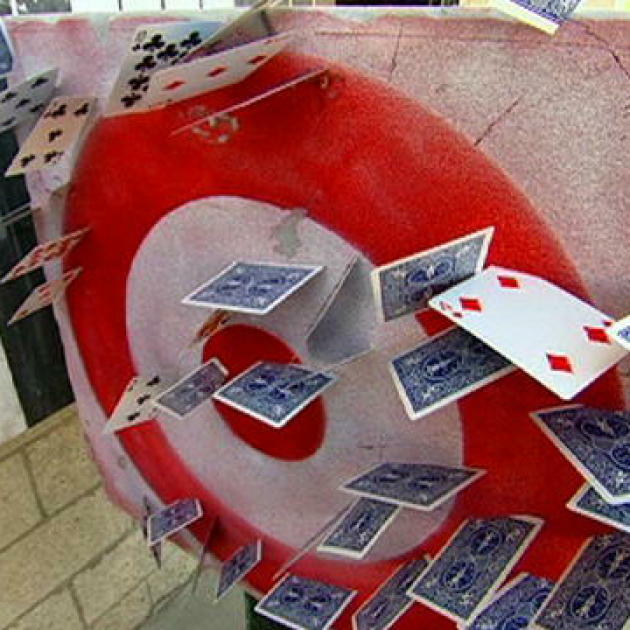 Jamie & Adam built a variant on a pitching machine to hurl the cards at high speeds. Then, for some reason, Jamie stood in front of it. While the machine never SERIOUSLY injured him, thus “busting” the myth, he DID get a few cards buried non-negligibly in his chest. Like this, but with a hairy torso. Now seems like a good time to point out that most myths involving human (and animal) subjects don’t actually rely on living “guinea pigs.” For most of the series, the MythBusters put a dummy named “Buster” in the line of fire to test such myths, or else constructed mock body parts out of specially-formulated ballistics gel. More recently, pressure-sensitive canisters have been used to test the lethality of explosions, and, in an unexpectedly gory twist, the hosts have increasingly used pig carcasses for myths of mutilation. Got questions about snapping industrial cables or alternative cannon ammo? Just ask Porky. Other myths test the validity of folk sayings. For instance, just how easy IS it to shoot fish in a barrel? Well, that depends. While it’s still tricky to hit any one specific fish, bullets of high calibre will produce a sufficiently large shockwave to kill any piscine prey, regardless of accuracy. Or, as the end of the episode reveals, you could just track down a 3,000 rounds-per-minute, jeep-mounted minigun and obliterate the barrel itself. Another such myth had Jamie and Adam attempting to find a needle in a haystack. This time, the pair adopted a competitive approach, each creating his own means of needle retrieval (one gadget utilized a magnet to grab the needle,while the other flooded a chamber with water, causing the buoyant hay to float away). Still another saw the duo literally stealing candy from babies, a task made considerably more difficult due to the young charges’ tendency to cry and make the MythBusters feel guilty. Owing to their cinematic nature, “action” myths incorporating explosions and firearms are common as well. In case you were wondering, yes, a malfunctioning water heater can skyrocket from the basement through the roof and explode an entire house. Yes, submerging yourself underwater can protect you (for the most part) from bullets. And yes, it IS possible to spin a playground carousel using only gunfire. Kinda. The merry-go-round has to be really greasy. Why were you wondering that, anyway? The MythBusters have also produced a number of branded specials focused on improbable scenarios depicted in popular media franchises. These specials provide a bit of variety, and offer a chance for some nifty celebrity cameos. But the quality varies somewhat. The James Bond special, for instance, was awesome. Jamie and Adam rigged their cars with concealed machine guns (even fixed guns proved surprisingly accurate), and Jamie even got to try out a set of Ben-Hur-style hub spikes that tore through Adam’s vehicle like can openers. But the Breaking Bad special was more of a letdown. The hosts limited themselves to “myths” from only the first few episodes of Breaking Bad (perhaps the special went into production early), and even then the criminal nature of the tested scenarios prompted the MythBusters to keep mum about how exactly they were actually doing what they were doing. Seeing as that’s, you know, the ENTIRE POINT OF THE SHOW, I must admit I felt a bit cheated. Can hydrofluoric acid really dissolve a human body? Yes, but only when mixed with other chemicals they can’t legally name. Well, that’s just great. Now what am I going to do with all these corpses? They didn’t even test my favorite “myth,” a Season 5 scene involving super-strong magnets. But we’ll talk more about that as this Countdown continues. In “Knock Your Socks Off Revisit” (Episode 143, “Mythssion Control”), the MythBusters try various methods for literally knocking someone’s socks off. While this myth had been declared “partly busted” previously, here the Build Team tested a wider range of variables. Ultimately, the experiment showed that you can “knock your socks off,” but only if you have comparatively slippery legs, and no elastic in your socks. Oh, and it won’t happen just by getting punched, either. You’re going to need to be struck by an 18-wheeler going SIXTY-FIVE MILES AN HOUR. They’re awfully thorough, those MythBusters. My very favorite myth to date is one which turned out to be completely accurate against all odds. The claim in question stated that, if you somehow manage to neglect a full cement mixer until its entire load hardens inside the drum, you can break up the hardened cement and “clean” the mixer by tossing in a stick of dynamite. Supposedly, this could all be done without damaging the machine. And then it worked, perfectly. Despite the blast, the cement mixer remained completely intact, and a fine silt of blasted cement trickled out the back, leaving the drum clean. The MythBusters and I were both awestruck. Not to be denied their prophesied explosion, however, Jamie & Adam called in their “demolition guy,” an FBI explosives expert who packed the entire cement mixer with bags of C4. Then, filming over a mile away from “ground zero,” the MythBusters stood atop a ridge to witness the largest “boom” in the show’s run. If this post inspires you to watch even a single clip of the show, make it the one below. Since its creation, MythBusters has risen to become one of Discovery’s most popular and longest-running series. The hosts themselves have become celebrities, and de facto mascots for Discovery and its associated channels. For example, Jamie, Adam, and Build Team members Grant, Tory, and Kari have all served as emcees for the Science Channel’s annual coverage of the national “Punkin Chunkin” competition at Thanksgiving. Jamie & Adam even have a touring “live show” version of the program in progress. It seems nothing can stop the Mythbusters juggernaut…not even an accident in which they accidentally SHOT A CANNONBALL THROUGH SOMEONE’S HOUSE. Though the incident was widely reported in the media, the series resumed regular production after only a short hiatus. I’d go so far as to call Mythbusters a national institution. These diligent pioneers deserve some kind of government subsidy. I’m serious. We should bring back the system of governmental and/or aristocratic patronage. Jamie, Adam, and the rest do us a service as valuable as any court composer or royal food tester. It’s really not that far off from the explorers of yore: Isabella commissioned Columbus to sail the ocean blue; We should pitch in to fund these intrepid “busters” as they investigate the more mundane, but no less niggling, conundrums of our modern age. But then I guess our cable subscriptions do just that. I think the Mythbusters’ success lies in the fact that they’re the rare entertainers who can appeal to both the intelligentsia and the…er…not-so-intelligentsia. They popularize scientific thinking, but they also blow stuff up. They teach principles of engineering and prototyping, but they also shoot machine guns. There’s something here for everyone. -My Mythbusters knowledge is by no means comprehensive. I’ve only seen maybe 15 episodes of the more than 250 out there. If the list of tested myths on Wikipedia is any indication (including such gems as “Can a gun discharge on its own if thrown into a deep fryer?” and “Can tennis be played on the wing of a plane in mid-flight?”), I really need to watch more of this show. -Cursory investigation has revealed that the “Don’t try this at home” bumper only precedes the show in the U.S.